Greetings Nail Geeks! I have another spoiler post for Baroness X Monthly Mythical Mysteries! 2018 is the year of space for the mystery boxes, and this month we have Mars up! 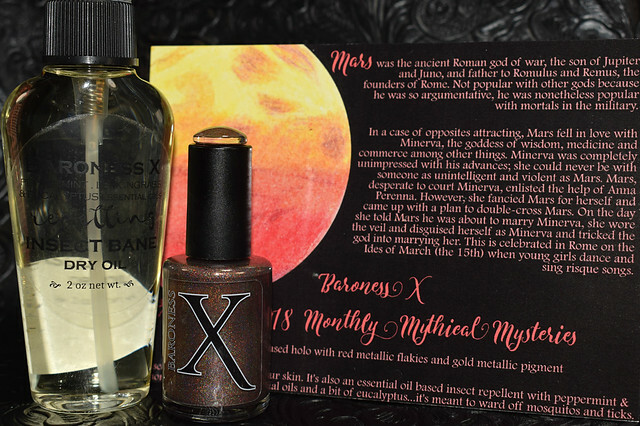 If you’re new to the brand, this is a mystery box that usually revolves around some sort of mythical creature or lore (though this year it’s a little different with the entire theme around our beloved galaxy) and includes a full sized polish plus an extra(s) that can range from bath and body stuff to never before released products. The extra this month is a pest repellent, for mosquitoes and ticks. It’s smells super pleasant: I’m getting mostly peppermint with eucalyptus as the secondary scent. I live in the South and this has been super handy to have since we take our son to the park frequently in the evenings. This was one of those packages I was chomping at the bit to photograph so I can try it out and no bites after use! Swatches show two coats with topcoat. I daresay this is my favorite one this year so far, and there have been some goods ones in the past months! The base is a bronzey chocolate brown, loaded with gold shimmer, linear holo and these awesome red flakies throughout. I want to see a collection with this type of finish! The red flakes can be seen in person too, and that gold shimmah is everything! This shade is a fantastic transition into fall. There is no texture to report after topcoat either (I’m using BX Liquid Crystal in my swatches and video swatches).